A surgical implant to treat obstructive sleep apnea reduced major symptoms of the disorder by nearly 70%, according to a study published online Wednesday in the New England Journal of Medicine. The new device stimulates a nerve at the base of the tongue, opening the airway. It is one of several new technologies being developed for sleep apnea, a disorder in which people stop breathing during sleep. Sleep apnea already has a very effective treatment, CPAP, or continuous positive airway pressure. But studies show that anywhere from 30% to more than one half of patients can’t or won’t use CPAP as directed by their doctors. Some patients complain that CPAP machines, which deliver pressurized air through a face mask, are uncomfortable and unwieldy. Sleep apnea, which is characterized by loud snoring and daytime sleepiness, is linked to a host of serious health problems, including an increased risk of heart disease, diabetes and stroke. The new implants will “be for a subset of patients, not for all patients,” says M. Safwan Badr, president of the American Academy of Sleep Medicine and chief of the division of pulmonary, critical care and sleep medicine at Wayne State University School of Medicine in Detroit, who was involved with the study. Indeed, earlier studies with the implant showed that it didn’t work as well in patients who were very obese or who had certain kinds of soft-palate collapse. The current study excluded people with certain health conditions, a body mass index of more than 32 and particular types of airway collapse. In the new study, 126 people with moderate to severe sleep apnea who had tried CPAP but couldn’t tolerate it had the new device surgically implanted and were followed for 12 months. The participants underwent overnight sleep studies before implantation and then again at two, six and 12 months. After treatment, the number of times they stopped breathing, either completely or partially during sleep, was reduced by 68%, to nine times per hour, down from 29.3 times per hour. Also, the number of times their blood-oxygen levels fell significantly, the so-called oxygen-saturation index, was reduced by 70% to 7.4 times per hour from 25.4 times per hour. Two patients had to have a repeat procedure because of pain at the implantation site. Other side effects included muscle soreness, temporary tongue weakness and tongue abrasions. The study was funded by the device’s manufacturer, Inspire Medical Systems Inc. of Maple Grove, Minn. Inspire’s device is approved in Europe; the company is applying for U.S. Food and Drug Administration approval. “Some patients we encounter, despite our best efforts, we cannot get them comfortable with [CPAP] therapy,” said Patrick J. Strollo, professor of medicine and clinical and translational science at the University of Pittsburgh Medical Center and lead author of the study. 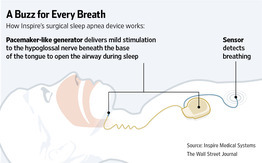 The new implantable device “has the promise that we really have another option to treat patients.” About 18 million Americans have sleep apnea, according to the National Sleep Foundation, a nonprofit research and advocacy group. The new device is placed under the skin of the chest. One electrical lead extends up the neck and encircles the hypoglossal nerve, which runs beneath the base of the tongue. The other lead extends to the middle of the chest, where a sensor detects breathing. The patient turns the device on with a remote control when ready for bed and turns it off upon waking. During sleep, the device electrically stimulates the hypoglossal nerve with each round of breath.